TATS A KOOL CHALLENGE: Tribute to Mary Konior.Part 1. My 25 Motif Challenge, was to tat 25 animals in a year, plus other tatting too of course! I completed the challenge and have challenged my self to tat another 25 animals, tho' this may take more than another year as there are so many other things I want to tat. Search this Blog for anything you thought you might have seen here. Tribute to Mary Konior.Part 1. As most of the people reading this blog will know, Mary Konior died in January this year. 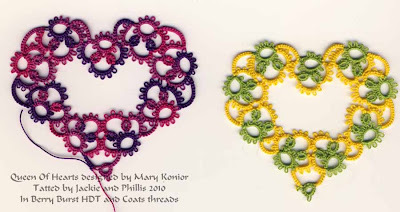 She was a wonderful tatter and designer, author of three tatting books..of which I am lucky enough to have two. A Pattern Book of Tatting, published in 1985 is a traditional pattern book with good black and white photographs and full written instructions. Tatting with Visual Patterns, published in 1992 must have been pretty revolutionary. 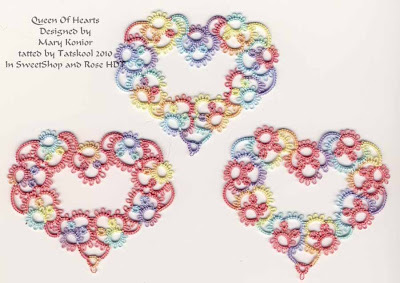 Packed with colour photographs to show off the tatting, each design has only a small amount of written instructions but is accompanied by a very clear diagram. Both books are absolutely crammed with designs and know how tips. A veritable treasure trove. What a wonderful legacy she left for us. Many blogging tatters are tatting and showing her designs in tribute to her..and I feel that I must join them. The first design that I tatted was her Queen of Hearts....in Flora 20 to see how easy/difficult it was.... how much thread it took....and which shuttle tatted which bit. The answer was that shuttle 1 took about 4mm..it tatted the rings, and shuttle 2 took 5.25m and tatted all the chains...provided that I did a Shoe Lace Trick (SLT) before and after every large ring. I like that....now to try it in two colours...the first one to hand was SweetShop solid Rose.. for the rings. Lets look at those 3 together.....an interesting little experiment. 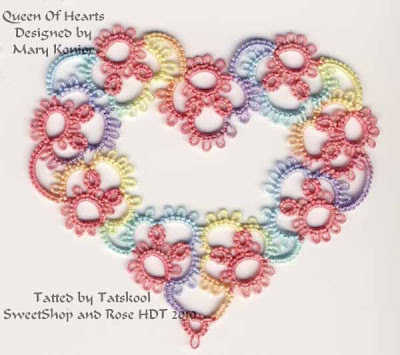 Of course as this was my first time tatting with my new SweetShop and solids after my original trials.....tatted before the 'Hope' Butterfly....I was itching to try it out using each of the solids.....but...not enough time!! Armed with spanking new copies of tatting with visual patterns my tatting buddies tatted this too. I think that will be enough for today...more soon. The hearts are all so lovely! I don't think I can pick a favorite. Love the soft colors you used. Excellent!! Beautiful hearts! It is always so interesting to look at the variations in color which you tat up. I am still trying to learn when to go solid and when to go (or NOT) to go variegated. It helps me to see side-by-side comparisons like this, not to mention it being so pretty to look at! Wow what a lovely assortment of colours!!!! Love them all!!!! More loveliness in abundance! 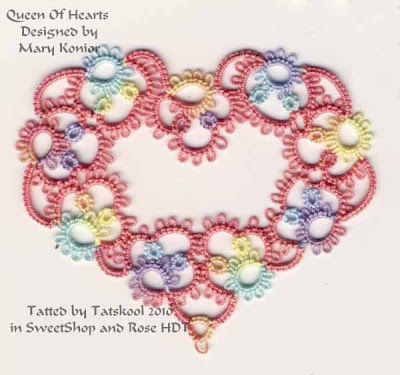 Hearts fit for several queens, LOL! All are stunning, it is hard to pick one over the other. Yet, it came as a shock that the rosy hearts didn't leap off the screen and scream "Love me!" What?!? Am I sick or something? I'm going to blame fever-fueled psychosis, because not liking the rosy hearts is illogical. Every other one stole a little piece of my heart. Looking forward to part II! I am humbled by your hearts in your new SweetShop thread. They are glorious! Hi Tatskool, They are just lovely. I love how you tatted up and compared the colour threads. My favourite is Berry Burst. Thank you for sharing them. I have not tatted this but with your thread requirements, I will soon. 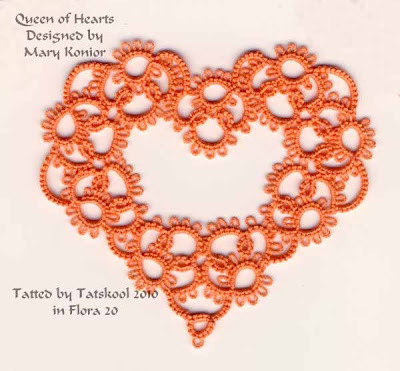 I like the heart with the Rose chains - what a lovely tribute to Mary Konior, she would have enjoyed seeing these! Thanks Patrycja, ArtyLady, Carol and Typs for your approval, means a lot to me. Hi SewMuchFun now that is the fun bit seeing how a design looks in different colourways, wish i had time to do them all. Hi IsDIhara may be you have sugary, syrupy overload, too much cough syrup???? I forgive you! A humbled Fox Gosh! thanks. Hi Umi always nice to hear from you, Yup the Berry Burst is delicious, pity i don't have any to try with. Hi Maureen, I don't know which I like the best...probably the next one! Can anyone give me a heads up on how many stitches between each picot? I am so new 2 weeks of learning. I would appreciate any help. I love your comments they keep me blogging. Every comment is much appreciated, but please try not to use my real name in a comment or on your blog. Tatskool is my on line name and one that I really like. Thanks. and pattern pages are here. Oh My Gosh, Oh My Golly!! Tribute to Mary Konior Part 2. Awarded to me by Lady Shuttlemaker, the award is for being...1. SEASONED; She has blogged for at least one year. 2. PROLIFIC; She writes several posts each month. 3. FUNNY; She make us smile with her witty humor. 4. ADDICTIVE; She keeps us coming back for more. Awarded to me by TattyCat (Laura) and Ridgetatter (B.J. ).